A week long programming stunt dedicated to weed that appeals to all the senses and culminates in our high holy day 4/20. 2017 marked the first ever celebration of all things cannabis on prime time TV with WEED WEEK — resulting in our highest rated week in network history. This is our “Shark Week” - the week where we remind the world that our brand is on the right side of history with our celebration and thoughtful exploration of a watershed cultural movement. We successfully launched this in the US and several other international markets. Branding, photo briefs, creative briefs, design briefs, international design guidelines, a 30 minute TV show, rich media banners, wildpostings, on-air interstitial content, a unique social campaign, weed rolling trays, experiential concepts, swag, non-traditional OOH executions, aerial banner, phone kiosks, small billboards. At VICELAND, we try to show the viewer behind the curtain a bit. It's a TV channel made of people and it's not just the hosts you see on screen. We often showcase employees. 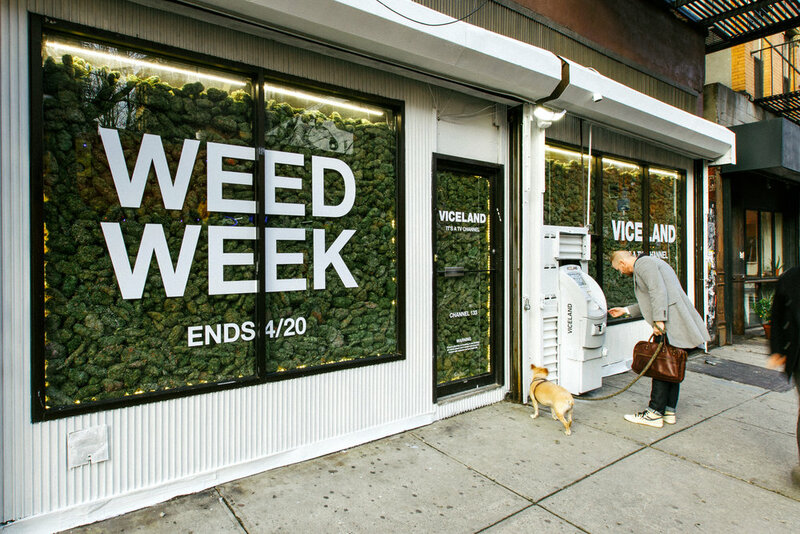 For this, we had two employees "brainstorming" how to launch Weed Week while smoking weed. Due to legal reasons, we obviously couldn't show people smoking in the office so we used the audio and animated the text to what they were describing. For Weed Week, we took cultural concepts around weed and put our own twist on it. We repurposed these for web and social. Weed is funny, can look beautiful and for some people, their entire world. Here is a collection of spots that use weed in these instances, done through mineratures. All the sound design was done by people who were stoned trying to create what objects or places sound like. We wanted to be the first to send a spliff into space. So we put one on a giant weather balloon. This was done by our London office. A big part of Weed Week was discussing the normalization of marijuana and the current cultural video of it. We are in the middle of a prohibition. What better way to show how silly that is then some government funded anti-weed spots that were created in the 60's. VICE Labs hired the world's top dab oil artist to create some custom creations. Trippy oil and paint based spots created by VICE Labs that are a fresh take on computer screensavers. Short image and text based spots that use some of our main photography a long with text animation. Short, sweet and fun. 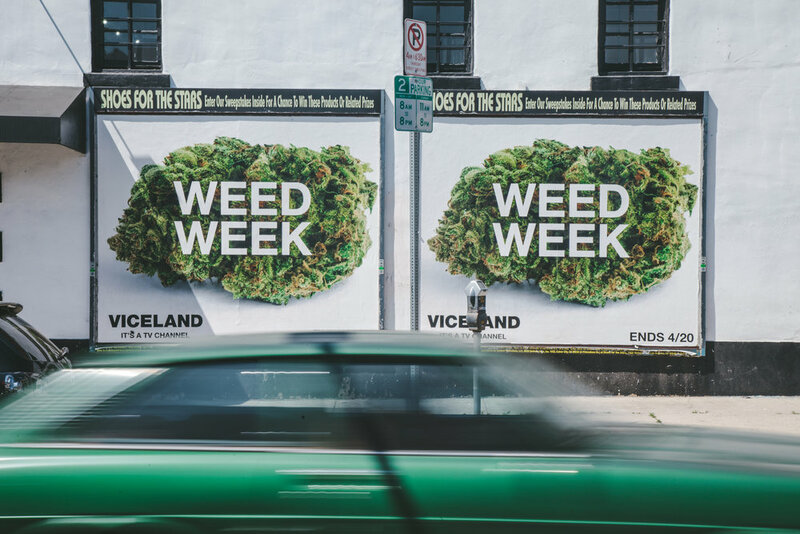 At VICELAND, one of our main brand's cultural touchpoints in marijuana (if you couldn't tell) so we examined what we could repurpose and make new with content we already had. We took b-roll and unused footage from our hit show Traveling the Stars: Action Bronson and Friends Watch ‘Ancient Aliens’. Its silly, it's dumb, it's perfect. The host of Weediquette, Krishna, is one of the main faces of weed reform for VICELAND. So we got him stoned and gave him some puzzles and tasks to solve. For every campaign, we create a CTA to call into our hotline and prompt the caller with a question. For this, we asked people to call in and tell us how they feel about weed. Part of our brand design and strategy for on-air is straightforward text spots that are copy driven. Here is a string-out of "stoner process thinking" and wikipedia style entries that make you think. Both are suppose to be "mindblowing". Again, playing into the beauty of weed, we dropped big nugs of weed to fill up the screen. 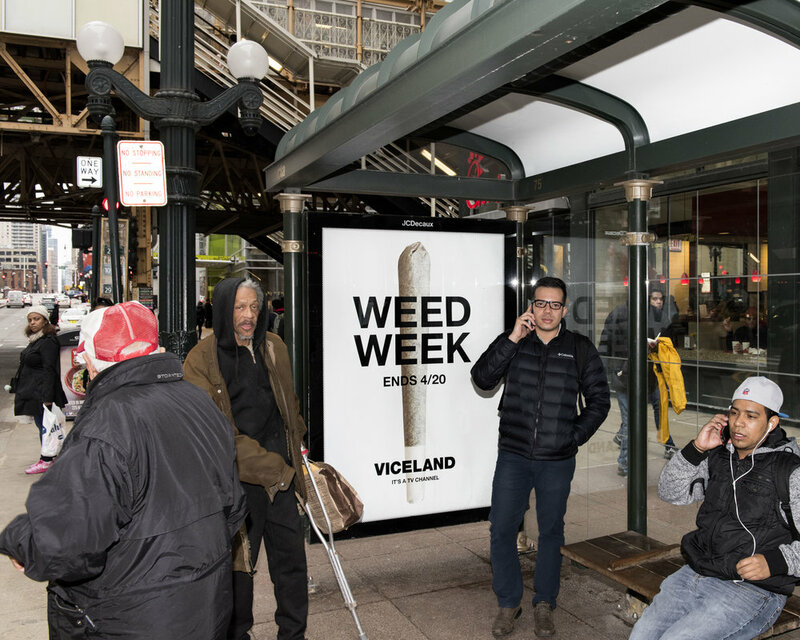 We later repurposed this for rich media web banners to promote Weed Week. 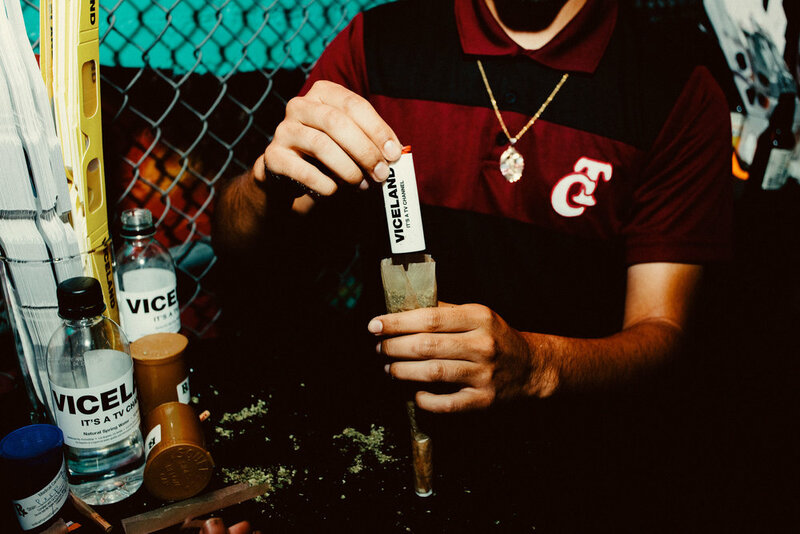 VICE Labs created these spots, showing the process of rolling joints and blunts. Sometimes when you get stoned and run into a problem, like having milk and cereal, but no bowl, you get creative with your problem solving. These are just meant to weird and be quick what-the-hell moments. Beautiful lazy susan shots of nugs with identifiers. We wanted people to keep tuned in and have fun watching Weed Week with their friends. We kept people involved by giving them multiple choice questions based on weed strains. Weed isn't just for fun. A lot of people use it for medical and health benefits. We interviewed people who use forms of THC to help with their lives. A 30 minute on-air quiz show unlike anything else. No host, no set script and really stoned contestants. Myself and a few other people were in the backroom giving questions and directing the show on the spot based on the contestants stoney unexpected answers. 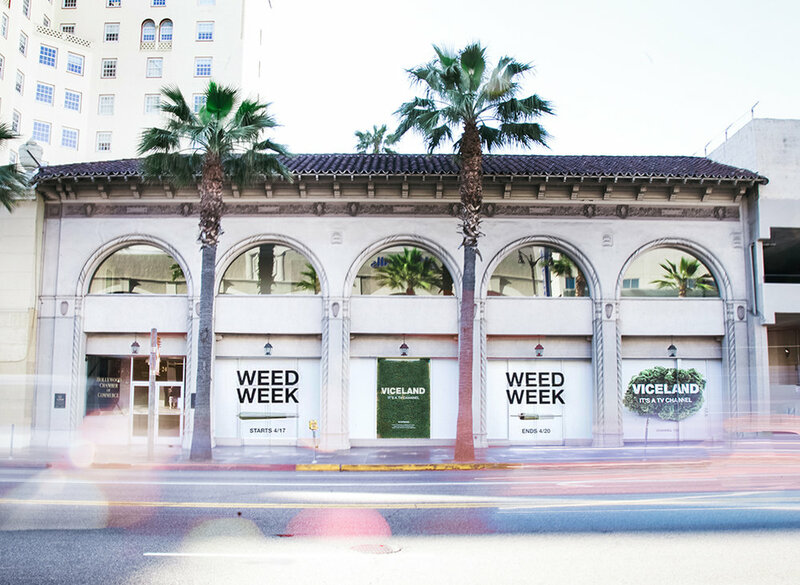 We created two storefronts that were filled with weed. We also set up a custom ATM that if you hit 420 on the number pad it would print out a weed receipt. We also pumped out weed fragrance via a fan. We used a varietty of beautiful weed photography to convery messaging about the good and bad parts of smoking weed. We specialty printed the phone kiosks so they would be unlit during the day and lit at night. Created in a dozen different sizes. The video below is the main creative. We did targeted buys and also bought digital space on food, health, marijuana and travel websites. For all big campaigns, we also do gif versions for VICE O+O (not listed here). Parties thrown on April 20th in states where weed is legalized. Through exclusive partnerships with Weed Maps and other marijuana companies, we got a lot of people really (legally) stoned. We even had some celebrities there a long with our VICELAND Bus. During Weed Week we ran a social campaign where people could vote on different categories that were all weed based. The day after Weed Week ended, on 4/21, we announced the winners through on-air and social. This project still needs to be uploaded. Please check back later or email me.